The many health benefits of tomatoes can be attributed to their wealth of nutrients and vitamins, including an impressive amount of vitamin A, vitamin C, and vitamin K, as well as significant amounts of vitamin B6, folate, and thiamin. Tomatoes are also a good source of potassium, manganese, magnesium, phosphorous, and copper. Tomatoes also have dietary fibre and protein, as well as a number of organic compounds like lycopene that also contribute to the overall health benefits that tomatoes can confer to our health! 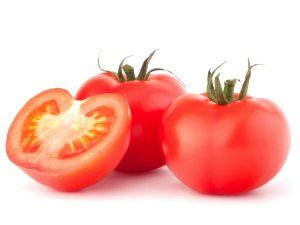 Tomato contains a large amount of lycopene, an antioxidant that is highly effective in scavenging cancer-causing free radicals. A single tomato can provide about 40% of the daily vitamin C requirement. Topical application of tomato juice is even known to cure severe sunburns. Daily consumption of tomatoes protects the skin against UV-induced erythema. Tomatoes rank high in the preparation of anti-ageing products.